Like our PTFE spray guns, our spray gun assemblies deliver the highest performance in durability and defending against corrosion in harsh chemical conditions. This water spray gun assembly comes complete with a spray gun and hose, as well as interconnecting and source fittings. The included spray gun features ½ female NPT inlet thread. Water flow is controlled by using the trigger situated on the rear of the spray gun’s body. Accompanying the gun is a 3/8" ID x 1/2" OD long bendable eight foot hose. 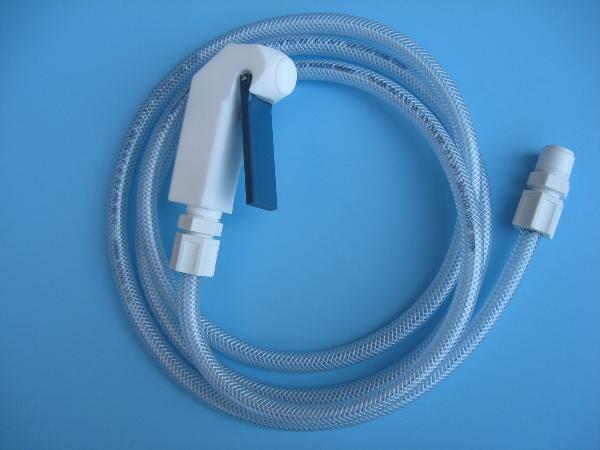 Made of PTFE tubing, the hose is very flexible and provides the durability necessary for a controlled environment. 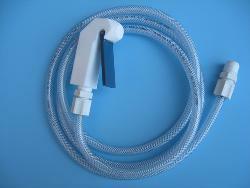 The hose and other accessories attach to the spray gun with included fittings. The interconnecting and source fittings are male connectors with PTFE bodies featuring PVDF nuts. Each fitting measured 1/2” tube x 1/2” MNPT. Contact one of our sales representatives regarding for assistance with selecting a water spray gun assembly appropriate for your application.